After more than a year of negotiations in overtime, the Norwegian government has struck a new deal with the European Union (EU) to ensure Norwegian exports access to EU markets, especially fish and seafood. Officially, the deal is billed as Norway’s contribution towards boosting social and economic equality in Europe. “This is a very good agreement,” said Vidar Helgesen, the government minister in charge of issues involving the EU and Norway’s so-called EØS avtale. That’s the pact that regulates trade between the EU and the European Free Trade Association, which comprises the European countries including Norway that are not members of the EU. The EØS pact itself applies to the European Economic Area (EEA) made up of Norway, Iceland and Liechtenstein, with Norway providing around 97 percent of the money sent to the EU. The new agreement hammered out calls for Norway to contribute nearly NOK 3.4 billion (EUR 388 million/USD 407 million) every year to 15 of the least affluent members of the EU, including such countries as Romania and Greece. That’s up from the roughly EUR 360 million that Norway was contributing every year from 2009 until 2014, representing an increase of around 11 percent. That’s in line with average inflation rates in the recipient EU countries, according to both the EU and Norway’s foreign ministry. Since the EU initially demanded an increase of as much as 80 percent in the money it receives from Norway and its two much smaller partners, Helgesen can be justified in claiming that it’s a good deal. The Norwegian delegation managed to bargain down the EU’s demands by a significant amount, at a time when the EU is facing economic crisis in several member nations. The new deal applies for the years from 2014 to 2021, since Norway’s last EØS avtale expired last year. Helgesen, from the Conservative Party (Høyre), has been working on its renewal since his party formed Norway’s Conservatives-led coalition government after the last national election in September 2013. The agreement also extends the pact’s term, from five to seven years. 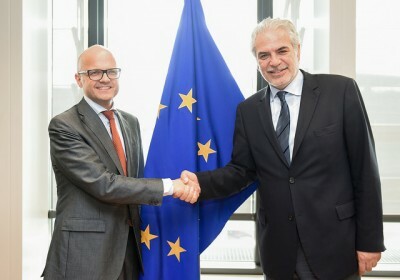 Helgesen said the EØS funds will primarily be used to stimulate new ventures and economic growth through innovation, research, education and increased mobility within the European labour market. The money will also go towards various efforts to reduce high unemployment rates within the EU, especially among European youth. Helgesen said the Norwegian government has “ambitious goals” for more targeted use of the EØS money over the next five years. That follows some criticism about how some of the money allocated during the previous five-year period was spent. He said some of the funds will also be set aside to “strengthen democratic processes and respect for human rights,” including money to aid Roma and other minority groups. The equivalent of NOK 850 million (EUR 94 million) will also be set aside, for example, for use outside the EU in countries like crisis-hit Ukraine, or Moldova. For Norway, the deal will allow market access for Norwegian exports, especially its fish and other seafood products which comprise Norway’s biggest industry after oil. Helgesen said Norway’s seafood industry will now have better market access in the form of new duty-free quotas for fish filets and other prepared forms of frozen mackerel and fresh herring. Quotas for spiced- and marinated herring (krydder- and eddiksild), for example will rise by 50 percent over the course of the extebded agreement period, from five to seven years. Fisheries Minister Elisabeth Aspaker said she was “extremely satisfied” with the new EØS agreement, which has long been controversial in some political quarters because it also obliges Norway to follow EU rules and regulations. Aspaker, though, stressed that the EU forms Norway’s biggest market and that it’s vital to maintain access. “This is positive for industry in Norway, and important for developing new markets for seafood exports,” Aspaker said, not least since Norway has gone along with sanctions against Russia that have restricted its market.